Cooking sauces is seen by some as the point where cookery becomes art. A good sauce can make relatively boring ingredients taste exciting and bring new colours, flavours and textures to a dish. French cuisine famously has the most diverse range of sauces of any European cuisine. Even before the emergence of Escoffier and the birth of nouvelle cuisine, French cookery was seen as being defined by the variety and richness of its sauces. There are many names for the many different ways in which ingredients can be combined for a sauce but the most basic and perhaps the most important is the roux. This is a mixture of equal parts butter and flour mixed together in a warm pan with a wooden spoon. Once they have combined, the roux will dissolve easily into whatever sauce it is added to, giving it body and substance. 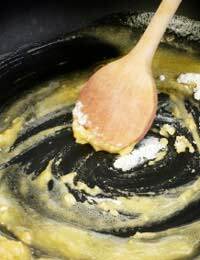 It can also bring a slightly floury flavour or texture so using a roux is a question of how much you wish to compromise the other flavours of the sauce, or the dish as a whole. Another crucial aspect of cooking sauces is the concept of reduction. Simply put, by cooking liquid stocks for longer on the stove, the water is cooked out of them and their flavour grows stronger. The French chef Antoine Carême divided the classic French sauces into four distinct groups, or mother sauces, which could then be modified according to personal or regional affectation. Tomato – Peeled chopped tomatoes form the base of the sauce and may be thickened by the addition of puree, starchy thickening agents like cornflour or arrowroot (tasteless extract from the root of the maranta plant, native to the south American tropics), or by cooking it with a roux. Bechamel – A thick white sauce made by cooking milk with a roux and often some mild spices or an onion studded with cloves for flavour. Espagnole – Not really Spanish at all, this sauce would likely be referred to as gravy if it were served to British diners. It is made with off-cuts of red meat and bones which are browned in a large pot with vegetables and then covered in meaty stock. It is reduced on the stove for several hours to intensify the flavour while being continuously skimmed to remove any particles that would spoil the velvety smooth texture. Veloute – These are usually light coloured sauces made by adding reduced chicken or fish stock to a roux. Veloutes are probably the most beloved of all of these by modern chefs because they have the greatest potential for supporting a wide variety of alterations. Many different types of alcohol are used in cooking veloute sauces and many different herbs, spices or other flavours can be added without being lost in the flavour of the stock. Special mention should also be made of the butter-based sauces such as beurre blanc, hollandaise and béarnaise. These involve emulsifying butter into a liquid base to give it a rich and velvety smooth texture. Beurre blanc is made by adding cubes of cold butter to a reduction of wine and lemon juice and whisking it quickly into the sauce before it can split. Hollandaise is made by adding clarified butter to beaten eggs combined with a vinegar-based reduction and similarly whisking it very rapidly to form a thick emulsion. Almost any sauce can be given added richness through a process called “monter au beurre” – the gradual addition of cubes of cold butter which are swiftly emulsified into the body of a hot sauce.